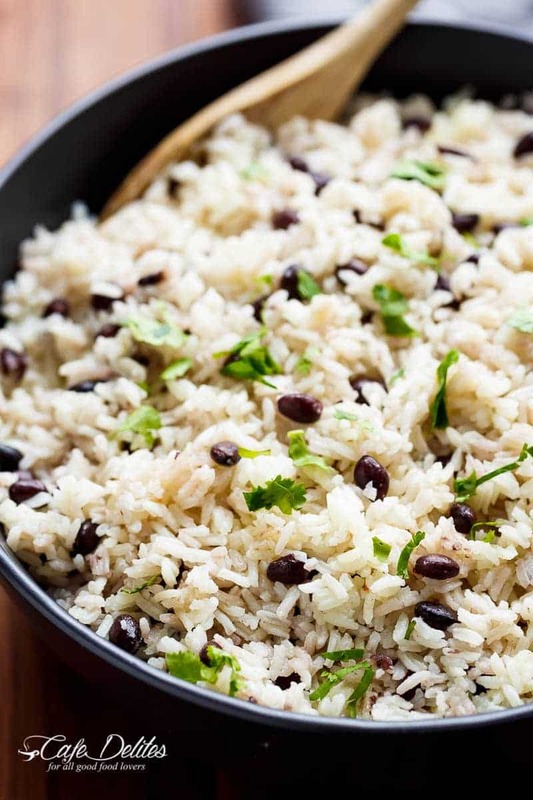 Black Beans and Rice is one of the best side recipes out there! Flavoured with a squeeze of lime juice, garlic and spices, this rice recipe is our family favourite! Our black beans and rice recipe can be served as a side OR as a main. An easy to throw together side dish that is so versatile, you can serve this with anything! A classic rice recipe, especially in Latin American cuisine, there are so many different ways to make this! However, this is our family recipe passed down by generations from our abuelitas (grandmothers) to get to your table. In our recipe, you can use canned beans for a quick and easy cook up, OR soak dry black beans overnight. If soaking, remember to cook them for a couple of hours first before adding them into your rice. 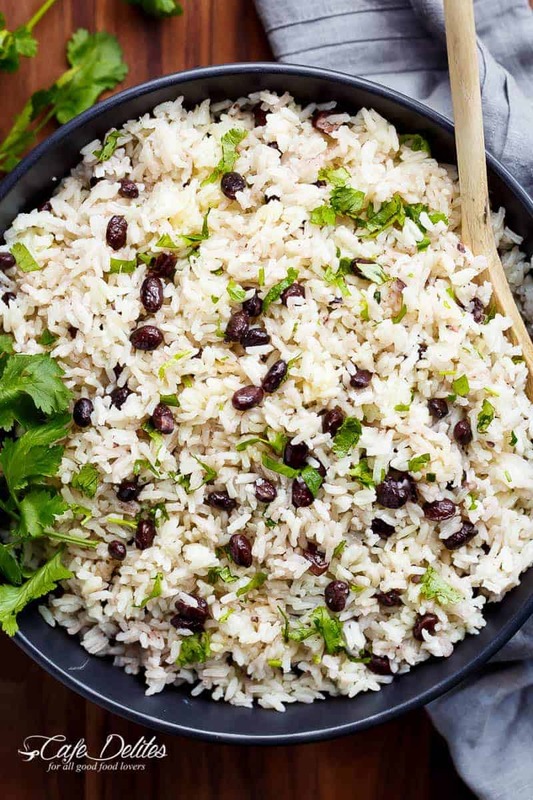 Rice with beans pairs perfectly with Chicken, Pork or Beef, PLUS tacos, burritos or even enchiladas. Sauté onion and garlic until fragrant, then add in ground cumin. Frying dry rice in the fragrant oil really sets off those flavours before adding in your broth. I use chicken broth (or stock) but you can use beef. Add your beans and bring it all to a boil, then simmer until rice is tender. Stir only once halfway through the cooking process to avoid your rice turning to mush. Flavour with a small drizzle of olive oil and lime juice, then mix through fresh chopped cilantro (or parsley). For a low carb option, try our Cilantro Lime Cauliflower Rice! Black Beans & Rice is one of the best side recipes out there! Flavoured with a squeeze of lime juice, garlic and spices, this rice recipe is our family favourite! Heat oil in a stockpot or saucepan over medium-high heat. Add the onion and sauté until onion is transparent. Add the garlic and sauté for a further minute. Add the cumin and rice, mix the flavours through and sauté for a further minute. Pour in the broth and beans, bring to a boil, cover, reduce heat and simmer for 20 minutes, or until rice is tender (stirring half way through). Remove from heat and drizzle with a small amount of olive oil (about 2 teaspoons), lime juice and cilantro. Taste test; season with a little salt and pepper, only if needed and as desired. Add in chopped jalapeños, chili’s, or cayenne pepper for some added heat!